Featuring a very special (and spatial) library. 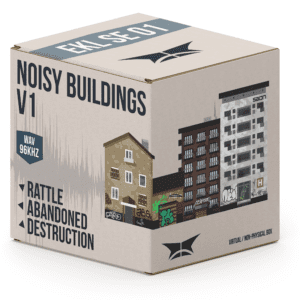 If you want true natural interior noises, Noisy Buildings delivers. The pack contains high-quality sound files, recorded in abandoned spaces. This first volume represents rumble and rattle sounds, perfectly suited for psychedelic and horror madness – or just when you want to create an unsettling atmosphere. The sounds are rich in natural reverbation, which is specific for large and medium building spaces. For example, you can find very loud and strange sounds of breaking windows, falling into the elevator shaft.